Returns true if the user is anonymous (has not been authenticated). This property returns true if the user account has the Act As Part of the Operating System permission, which means it is a highly privileged system account. Retrieves a collection that contains instances of IdentityReference classes, which returns the SID values for the groups the user is in. This property returns the Windows account token for the identity. Gets the SID for the token owner. Gets the user’s SID. You can use this SID if you want to change permissions for this user on ACLs through the classes provided in the System.Security.AccessControl namespace. You can use this method to run a code under the corresponding Windows account. 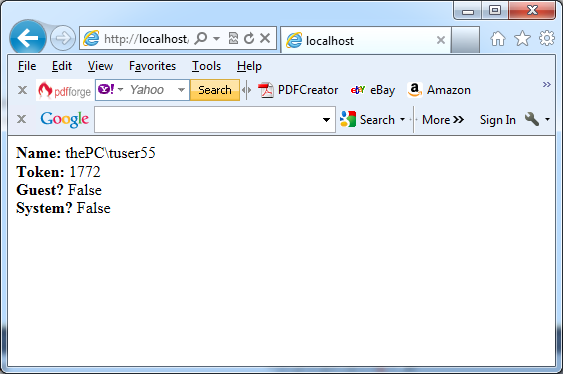 This static method creates a WindowsIdentity that represents an anonymous user. This static method creates a WindowsIdentity that represents the identity tied to the current security context i.e. the user whose identity the current code is running under. By using this method in an ASP.NET application, you can retrieve the user account under which the code is running, not the user account that was authenticated by IIS and is provided in the User object.